A 22-year-old primigravida reported in the emergency department after being referred from a peripheral hospital. Patient was in obstructed labour, and prenatal ultrasound (USG) revealed a dead and malformed fetus. There was no significant family history. A 2 kg male fetus was delivered vaginally after craniotomy and cephalocentesis. The infant was macrocephalic with a small but normal appearing body. An autopsy was performed on the fetus using the en block technique. Eye examination showed setting sun appearance and congestion of the conjunctiva [Figure 1]. The cranial vault was almost entirely occupied by multilobulated mass replacing the cerebral hemispheres. 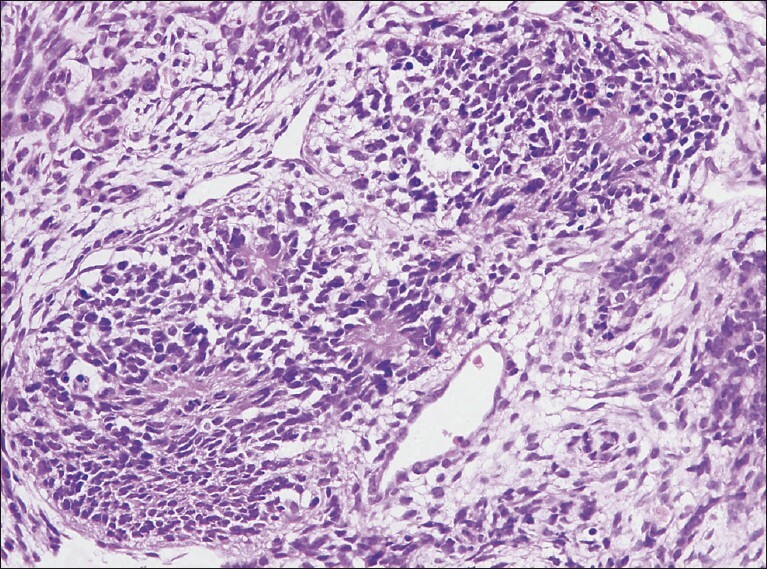 Grossly, mass was predominantly solid with areas of hemorrhage, necrosis, and cystic change. Microscopic sections demonstrated a variety of tissues from all three germ layers, including immature as well as mature elements [Figure 2]. The predominant tissue was neuroectodermal, in the form of neuroepithelial rosettes [Figure 3]. Interspersed albeit sparsely were mesodermally derived cartilage, primitive stroma and endodermally derived respiratory and enteric epithelium in the form of cystic structures. A glial fibrillary acidic protein (GFAP) stain was done which stained positive for mature and immature glial tissue. A final diagnosis of immature teratoma grade III was made. Gross and microscopic examination of other visceral organs was unremarkable. Congenital brain tumors are rare, representing only about 0.5-1.9% of all childhood brain tumors. , Teratomas constitute 0.5% of all intracranial tumors and 2-4% of intracranial tumors in children. Intracranial teratomas may arise from the pineal gland, quadrigeminal plate, and walls of the third ventricle, suprasellar region or cerebellar vermis. Although it is often impossible to determine the exact site of origin, prenatally diagnosed intracranial teratomas are predominantly supratentorial, in contrast to their infratentorial location in older children. , The prevalence of congenital intracranial teratomas is reported to be nearly equal in males and females in most series. 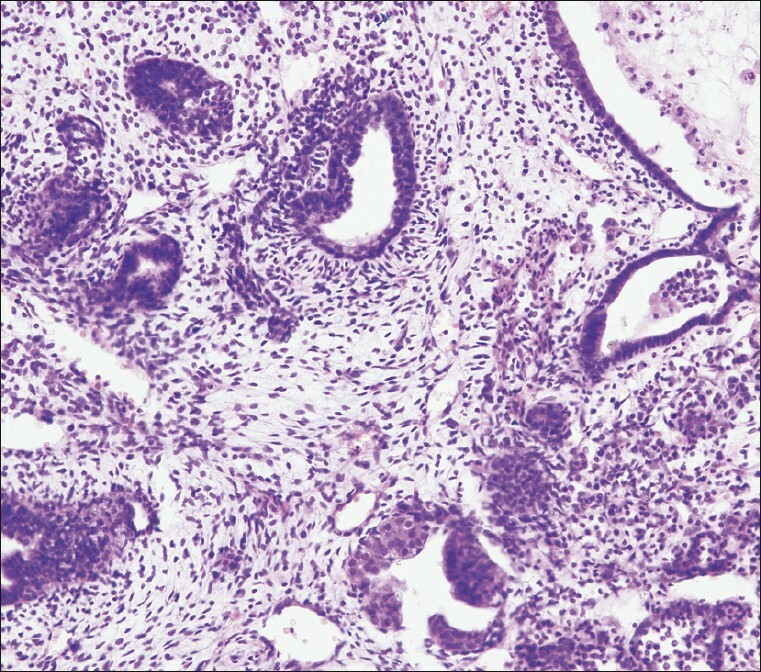 Various explanations for massive growth in the fetal period include i) time of origin of the neoplastic cells is closer to the time of conception, allowing a greater number of days of growth before birth and tumor detection, ii) in utero neoplasms have an unchecked growth pattern because of relatively minimal clinical systems produced in the fetus, iii) fetal period offers a better milieu for growth of the immature elements. Teratomas originate during the 3 rd and 4 th week of embryonic development, where all cells are totipotential. Although, extragonadal teratomas, which are usually congenital and in the midline, have been proposed to represent misplaced conjoined twin pregnancies with diploid cells; gonadal teratomas, which appear later in life, are considered to arise from sequestered haploid germ cells. Histopathologic classification of teratomas includes mature, immature, and malignant varieties, but the malignant form is reportedly rare among congenital brain teratomas. Both mature and immature forms usually contain tissues from all three germ layers, including skeletal muscle, cartilage, bone, bronchial epithelium, gut epithelium, and neural tissue. Almost all childhood teratomas contain derivatives of all three germ layers, and head and neck teratomas frequently have a predominance of both mature and immature neuroectodermal elements. The prenatal diagnosis of intracranial teratoma, considered to be a rare event, is becoming more common and USG has emerged as a valuable diagnostic tool in prenatal detection of these tumors. The diagnosis of intracranial teratomas may be suspected by the abnormal rate of uterine growth and is established by the USG findings of polyhydramnios, enlarged biparietal diameter, hydrocephalus, solid and cystic intracranial lesions, distortion of the normal intracranial anatomy, and areas of calcification. The diagnosis is made at or after 20 weeks of gestation. However, the differential diagnosis for a sonographically diagnosed intracranial mass also includes astrocytoma, ependymoma, craniopharyngioma, choroid plexus cyst, and intracranial hemorrhage. The majority of cases have been delivered by cesarean section because of abnormally large head size and difficult delivery. However, in several cases, vaginal delivery has been possible, occasionally with prior cranial decompression. Treatment for viable cases includes radical surgical resection of the tumor, followed by either radiotherapy and/or chemotherapy. The extent of surgical resection is an important prognostic factor. If the patient survives, radiotherapy is usually postponed until 24 to 36 months of age to avoid complications such as stunted growth, endocrine disturbances, and neuropsychological problems. In conclusion, the prognosis of congenital brain tumor is related to the tumor histology; the prognosis for astrocytoma and choroid plexus papilloma is good,  but that for congenital intracranial teratoma is extremely poor, with a mortality rate around 90%. Thus, early diagnosis of immature intracranial teratomas is extremely important to prevent the mother from having further complications either due to intrauterine fetal death or psychological trauma of giving birth to a severely malformed baby. 1. Schlembach D, Bornemann A, Rupprecht T, Beinder E. Fetal intracranial tumors detected by ultrasound: A report of two cases and review of the literature. Ultrasound Obstet Gynecol 1999;14:407-18. 2. Buetow PC, Smirniotopoulos JG, Done S. Congenital brain tumors: A review of 45 cases. Am J Roentgenol 1990;155:587-93. 3. Odell JM, Allen JK, Badura RJ, Weinberger E. Massive congenital intracranial teratoma: A report of two cases. Pediatr Pathol 1987;7:333- 40. 4. Crussi FG. Intracranial teratomas. In: Crussi FG, editor. Atlas of tumor pathology, Extragonadal teratomas. 2 nd ed. Washington, D.C.: Armed Forces Institute of Pathology; 1982. p. 155-6. 5. Rostad SR, Kleinschmidt-Demasters BK, Manchester DK. Two massive congenital intracranial immature teratomas with neck extension. Teratology 1985;32:163-9. 6. Isaacs H Jr. I. Perinatal brain tumors: A review of 250 cases. Pediatr Neurol 2002;27:249-61. 7. Go JH, Kim TS, Cho SH. Massive congenital intracranial teratoma: An autopsy case. Yonsei Med J 1995;36:310-4.